©Tom Parr. Used with kind permission (www.kevparr.com)The Band was initially founded as a parish pipe band, at St. John's R.C. Church in Benchill, Wythenshawe. The parish priest at the time was Fr. 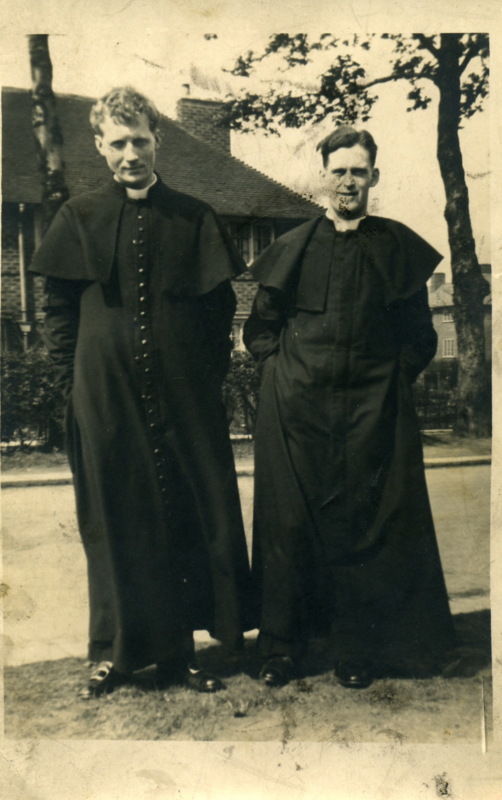 Murphy, often referred to as the builder priest for his talents in acquiring real estate and developing infrastructures for the Catholic communities of the North West, assisted by his curates, Fr. Kehoe and then Fr. English. In 1946, Fr. Murphy called a meeting of interested persons with a view to forming a band. Initially, all efforts failed, but a small group persevered and, in 1948, they successfully formed the Band which was then known as St. John's Pipe Band. Fr. 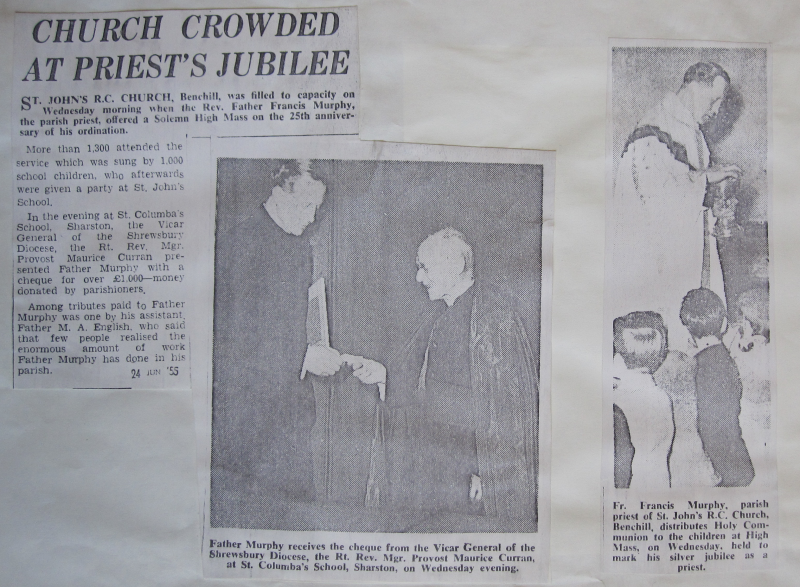 Murphy's ambitions clearly stemmed from a desire to create an active community in order to encourage the young boys and girls to play a key role in parish life. 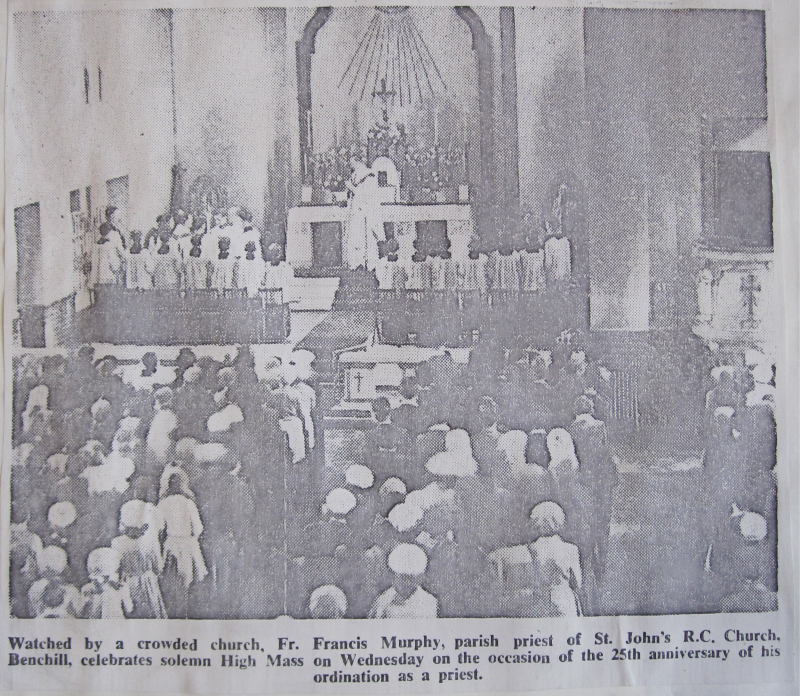 All manner of activities were organised within the parish, from football to netball, from amateur dramatics, with the Iona Players, to choral recitals, with St. John's Girls choir. And from Irish dancing, with St. John's Dancers under Margaret Carroll who later, as Mrs. Margaret O'Neal, went on to found the O'Neal School of Dancing, to St. John's Pipe Band. Both of the latter two groups performed under the Fianna Pádraig banner. Special thanks to Betty and Pat O'Hara for the loan of the magazineAll the various parish groups met, practised and rehearsed in adjacent classrooms or in the school yard at St. John's Primary School, so interaction between the young men and women - most of them friends from early childhood - was inevitable. 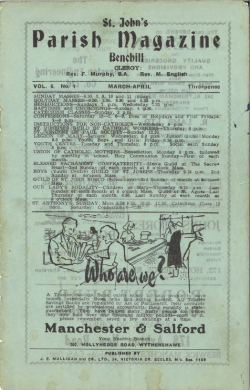 A brief look at a few of the pages of the Parish magazine from March-April 1953 is enough to see how the youth of the parish were involved in multiple activities, with Brian Lee and Jack (later Father) McLeish, for example, both of them Band members, playing the piano for the Dancers at the St. Patrick's Day concert held in Saint Columba's Hall, or Jim O'Connor, a Band member for virtually his entire adult life, who was also a regular player on St. John's first team in the football championship. Please take a closer look at the Magazine here. For some, it will bring back many happy memories, and for others, you'll be interested to see what your parents and grandparents were up to in the parish community of the fifties. Special thanks to Betty and Pat O'Hara for the magazine, as well as many other interesting memories and items.